An artists impression of an "eco-city" which is now under construction near the port city of Tianjin in northeastern China. Top leaders in Beijing hope the project will serve as a model for a long-term solution to the country's ballooning urban population, which is putting enormous pressure on already strained water and energy resources. At a construction site in northern China, a billboard boasts of a "liveable city" where residents can drink tap water, travel on clean energy public transport and enjoy acres of parkland. For now, the ambitious "eco-city" covering 30 square kilometres (11.6 square miles) of non-arable salt pans and former fishing villages has more cranes than wind turbines and will not be finished for at least another decade. But its developers hope the settlement near the port city of Tianjin will serve as an ultra-efficient alternative to ill-planned and heavily polluting mega-cities not only elsewhere in the country, but around the world. "We hope to influence our neighbours," said Goh Chye Boon, chief executive of Sino-Singapore Tianjin Eco-City Investment & Development Co.
"With the right ingredients, with the right eco mindset, I think together we can change the environment." The governments of China and Singapore have combined their expertise and finances to develop the future city, which has a planned population of 350,000 and includes schools, medical facilities and business districts. Foreign companies such as Japan's Hitachi and Dutch electronics giant Philips will provide green technology for the development, where buildings will be insulated and have double-glazed windows to increase energy efficiency. Nearly two-thirds of household waste will be recycled and 20 percent of the city's power will come from renewable energy sources such as wind and solar -- with the rest coming from other sources such as highly polluting coal. Treated sewage will be channelled into a lake which will supplement water supplies for local communities. "Eco-cities are needed because China is facing a huge challenge of pollution," said Hiroaki Suzuki, a top specialist in the Finance, Economic and Urban Department of the World Bank, which is assisting on the project. "China's serious pollution problems do not mean that it cannot develop an eco-city." 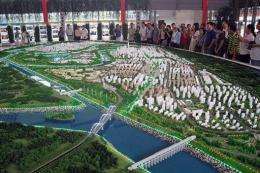 Visitors look at a model of an "eco-city" which is now under construction near the port city of Tianjin in northeastern China in September 2010. Greenpeace supports the development of "eco-cities" as a way to handle urban overcrowding, which it says could prevent China from curbing its world-leading carbon emissions and meeting its ambitious energy targets. Top leaders in Beijing also hope the project will serve as a model for a long-term solution to the country's ballooning urban population, which is putting enormous pressure on already strained water and energy resources. China is undergoing an unprecedented urbanisation process as hundreds of millions of people have headed to fast-growing metropolitan areas since the nation's economy embarked on a fast-paced growth track more than 30 years ago. To handle the massive influx of people, China may need to invest up to 3.6 trillion dollars in urban infrastructure by 2020, state media said last month, citing a report by the state think-tank China Development Research Foundation. Greenpeace supports the development of "eco-cities" as a way to handle urban overcrowding, which it says could prevent China from curbing its world-leading carbon emissions and meeting its ambitious energy targets. "It's a really good idea because that is where change has to happen," Yang Ailun, climate and energy campaign manager for the environmental watchdog in China, told AFP. But Yang cautioned it was very difficult for Beijing to develop truly low-carbon cities when there was no clear definition of the term and the country was still developing. China has already broken ground on a separate ecologically friendly settlement that has yet to been finished. In 2005, former British prime minister Tony Blair and Chinese President Hu Jintao agreed the two countries could collaborate on building the world's first so-called "eco-city" Dongtan, near Shanghai. The "city of the future" was meant to be showcased at this year's World Expo in Shanghai but the settlement remains in the planning stages. A truck drives into the site of an "eco-city" which is now under construction near the port city of Tianjin in northeastern China in September 2010. For now, the ambitious eco-city covering 30 square kilometres (11.6 square miles) of non-arable salt pans and former fishing villages has more cranes than wind turbines and will not be finished for at least another decade. 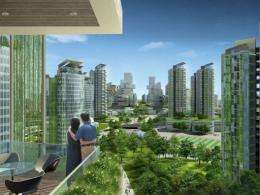 Plans for dozens of other low-carbon "eco-cities" and towns are springing up around the country, as developers rush to cash in on the green movement and government authorities seek to attract foreign investors to their regions. China recently carried out low-carbon technology pilot projects in five provinces and eight municipalities, with the aim of rolling them out nationwide, said the country's chief climate change official, Xie Zhenhua. "We hope that through our concerted efforts, we can work out incentives and policy measures that support upgrading of technologies and changing people's consumption patterns," Xie told reporters this week. Goh insists the Tianjin development will not be another Dongtan -- construction of the first stage is under way, with the first batch of apartments on sale and residents due to start moving in as early as next year. "We are far from the Dongtan example -- we have got over the masterplan stage and are executing it now," he said. When AFP visited the sprawling site, several buildings were under construction, some streets had been paved and marked, trees planted and wind-solar powered street lights erected. But it is a long way from the miniaturised model on display in the exhibition hall, which shows hundreds of high-rise buildings surrounded by 1,500 hectares of parks and wetlands, broken up by crystal-clear waterways. "Treated sewage will be channelled into a lake which will supplement water supplies for local communities." Whatever happened to their last ecocity idea, Dongtan? Well, it actually makes a lot of sense to build a city and all of it's infrastructure ahead of time, instead of the constant repair, replace, and expand crap that we do here in America. "maybe they had some unexpected setbacks"
Some things never change. The passion of a certain class of political regimes for showing off is one of them. An old joke will explain it well, I hope. Many years ago, maybe when I was still young, the Comecon (aka CMEA) countries decided to put the rotting capitalist West to shame, and build the biggest ship in the world. So, every country coughed up something for the project -- the Russians provided the steel and the gasoline, the East Germans the engines, the Bulgarians - some apples and tomatoes and cucumbers for the kitchen, etc. Finally, the ship was built, huge and beautiful and shiny in the glorious morning sun. The sublime moment of takeoff approached, the capitan pulled the rope and blew the powerful ship horn, the sound flew over the sea, the mood soared ... but the ship would not move. Because it was designed so that all the power went into the whistle. 20% of the city's power will come from renewable energy sources such as wind and solar - with the rest coming from other sources such as highly polluting coal. Right, so all will be happily using their eco-friendly gimmicks like electro-powered vehicles and devices, and none will care about what is actually happening "behind the curtains", where instead of the gasoline burned in their engines, it is by 80% comming from burning coal to satisfy their energy needs, which after taking into account transmission/coversion and efficiency loses, even outweights all of the 20% gained from utilising solar/wind.. So apart from recycling nearly 2/3 of household waste/sewage and growing a few more trees in the area - which actually is quite great, there is very little done regarding pollution that comes from generating the needed energy - just displacing the "waste disposal" location away from the city, to the place where the coal plant will be.. If they just built a nuclear plant instead..